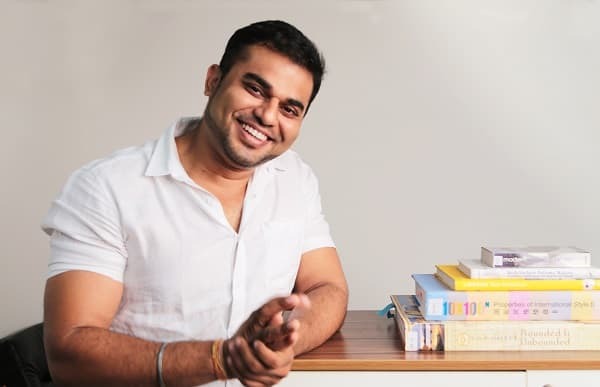 HelpMeBuild Founder Prasoon Shrivastava: "Passion Drives Business And Diverse Knowledge Sustains It"
Belonging to a middle class family, Prasoon Shrivastava completed his schooling from Jabalpur and went on to do his Bachelors in Architecture and Planning from LBH College, Mumbai. Upon graduation, at the early stage of his career, Prasoon worked on projects involved in the design of many residential, commercial and institutional projects across central India. Later, work took him to Dubai, where he partnered with Arkiplan International and set up the operations of Arkiplan International in India in January 2010. After completing his work overseas, on returning to India, Prasoon found stark differences in work practices. He realised that inefficiencies in both - project design and execution were at their pinnacle. The residential and commercial projects of varying scales that he worked, made him notice that the architecture and interior design project execution industry needed a new perspective. This was only possible though technological innovation that could aid advancements within this field. By the year 2014, all these new concepts in Prasoon's mind gave the brith to his first startup - HelpMeBuild.com - a one-stop-solution, for creating of knowledge to streamlined execution of a project. He officially launched the website in early 2015. In this exclusive interview with CrazyEngineers, we got Prasoon Shrivastava to talk about his 2 year old startup, the response he has received, the competition in this domain, his plans for scaling it up and a lot more. Read on! CE: Tell our readers more about HelpMeBuild. What does HelpMeBuild offer to its customers? Prasoon Shrivastava: HelpMeBuild is a technology centric - online based content driven, social commerce platform that offers full stacked solutions for the interior design and architecture industry. The platform enables users to draw inspiration through visual, video and written content, thereby creating an engagement model in an area that is relatively untouched within the Indian market. Helpmebuild help their users with curated content on residential and commercial designs & decorating ideas enabling them to take informed decisions. Home owners and corporates get inspired by the numerous décor styles ranging from mid-century to modern and contemporary styles and how to incorporate them in their homes and offices. They can ask questions, comment, like and share the ideas with their family, friends, consultants etc to take better decisions related to construction and remodeling of their spaces. Our managed-multivendor marketplace currently exceeds 100,000 products that are delivered in more than a thousand pin codes in all major cities. Currently, no online social ecosystem exists within the interior and architecture space, which provides solution ranging from interior and architectural ideas to home décor and furniture products to full stack design build services. Through Design+Build division, HelpMeBuild go the extra mile and offer their users, as well as their offline clientele, the ability to not only execute the ideas and inspirations available on the platform, but to also take advantage of full-stacked solutions in conceptualizing, designing and executing their very own dream homes, offices, hotels and beyond. CE: What kind of response has HelpMeBuild attracted in the last few months? Prasoon Shrivastava: HelpMeBuild has received an indeed a very positive feedback through the home décor ideas and photo inspirations, helping home owners and design enthusiasts in their decision making process for their homes and following trends across the globe. We are more than 10,000 signed up (sign up not mandatory) users strong, updated regularly through our newsletters about interior and architectural ideas and growing with monthly traffic of more than 1 lac spending an average of more than 3 minutes on our website. CE: Who are your biggest competitors in this domain? How do you maintain an edge over them? Prasoon Shrivastava: There is no competition per say in India which provides end to end solutions ranging from décor ideas to home décor and furniture products purchases to complete design-build services. In terms of full stack solutions, Houzz (US Based) is our major competitor globally but their business model differ in terms of design build solution as they refer their users to a pool of professionals for their architectural or interior needs. We have our in-house capabilities and strategic partners with whom we take care of any project no matter what scale with utmost priority and take it from concept till execution and hand-over keeping tap at all decision points and getting our clients posted on the developments of their projects. In India, competitors which come to close to our business model are livspace, pepperfry, urban ladder in terms of furniture & décor products selling. Our USP is our content which is curated in-house by our team of content writers, designers and architects. More than 2,000 visual content supported articles on home décor ideas and 30,000+ photo inspirations helping our user base to take informed decisions to enhance their dream spaces. CE: How do you build a successful customer base? Prasoon Shrivastava: We believe in quality and can proudly say that if a quality product is sold, customers are bound to reach you no matter what. CE: What is the revenue model for HelpMeBuild? Prasoon Shrivastava: Through multi-vendor marketplace and turnkey design build solutions, we have created a strong revenue model. CE: How do you plan to scale up from here? What are the immediate expansion plans? Prasoon Shrivastava: We are aiming to acquire 1 million users pan India online who are looking out for even a little renovation/ redecoration ideas for their homes through social media and online promotions. Also, we are planning to expand into overseas markets for our design-build services. CE: To what do you most attribute your success? What would say are the five key elements for starting and running a successful business? Prasoon Shrivastava: I believe in “We learn until we die”. Being a fitness freak, I constantly challenge myself to new goals and a continuous thrives to learn and explore more is what I most attribute my success. Respect Money: Respect money and it will respect you. Splurging money on any idea without any clarity of goals will lead to debacles. Every penny spent should be worth pending it as money saved is money earned. Avoid instant decisions: Do not make decisions in a hurry. Sleep over issues and weigh all the pros and cons to be sure that you are making the right decision. Have strong business fundamentals: Business fundamentals affect a company’s underlying value. These are the key performance indicators of a company’s health and future growth. Have Mentors and friends for guidance: Once I set my goal, I always seek suggestions from my mentors and friends. They bring out the subtleties owing to their knowledge and experience. Build a great team: Only a great leader can build a great team. The combined energy of a good team can take any business to new levels of success. CE: Who has been your greatest inspiration? Prasoon Shrivastava: During the early stage of my career I was influenced by my father, from whom I have inherited business ethics and honesty. Later, my senior partners in Dubai guided my approach in dealing with clients and inculcated patience and quality in my professional undertakings. CE: How do you go about marketing your business? What has been your most successful form of marketing? Prasoon Shrivastava: Currently we market about our business through social media and online promotions. A major part of our business is through word of mouth resulted through the design-build / Turnkey projects we have executed. CE: Thanks for your time. Any message for readers? Passion is what drives a business through the ups and downs while a diverse knowledge base in the form of a strong and efficient team is what sustains it. If you believe in our vision, please help by suggesting new startup companies to our team. It does not matter how small or big the startup is; whether it has raised funding or has achieved any milestone. Leave all the hard work of selection of startups to feature in Founders Circuit to our team. If the startup you suggested gets featured; we will proudly mention your name in the featured write-up. You can contact our team here.